Spira’s “walking shoes with springs” is an extremely well cushioned walking shoe that provides superb forefoot and heel cushioning. The patented WaveSpring is located in both the heel and forefoot for maximum impact absorption that will not break down over the life of the shoe. The mid-foot is supported by a co-molded external shank support structure to aid in torsional stability. This classic walking upper provides a generous fit for use with orthotics. 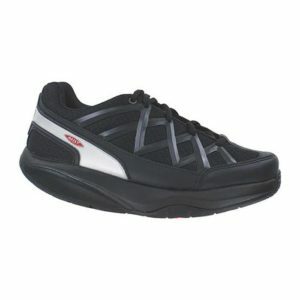 Breathable, agile and athletic best describes the MBT Mens Sport 3 Black.